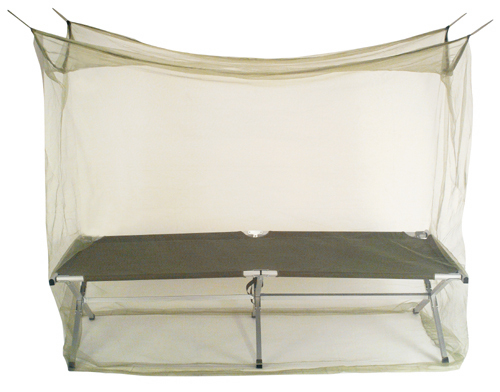 The Bed Net is designed to be mounted permanently or temporarily over your Double or Single bed to keep mosquitoes out. The netting has no doors, so there is no way that the mosquitoes can sneak through. If you want to get in, you lift the netting and duck in. The netting then drops to the floor. You can also tuck the netting in under the mattress for more secure protection. 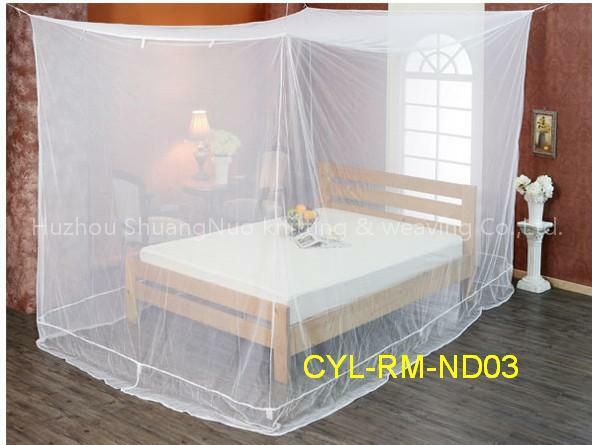 The mesh is extremely fine weave to keep out mosquitoes and other very small biting insects. The netting is durable nylon that does not tear easily. There are 6 attach points on the 4 upper corners (with optional 2 loops midway along the length if desired). We believe in sturdy functional products that will perform well and last a long time. This is a good product. Color: White. Weight: .6 kg. (1.3 lbs). Dimensions: 2 meters long, 1.8 meters wide, 2.1 meters high (6.5' long x 6' wide x 7' high). The Bed Net can be use outdoors or for camping if you have 4 trees to tie the corners to. During the day, most people gather the netting together and then lay it up across the top. This way, it is out of the way during the day when there are no mosquitoes. At night, when you are ready to sleep, you can pull it down and tuck it in, and the netting will be completely free of mosquitoes. This netting is used all over Africa, South America, and Asia where mosquitoes can carry Malaria and Dengue Fever. Mosquitoes feed at night, when we are most vulnerable. The best prevention for these diseases is not to be bitten. If you want more information on mosquitoes, please try www.mosquitosolutions.com or www.zapmosquitos.com/mosquito.